Origami models you can color online, print and fold! We are very happy to launch today Colorigami! 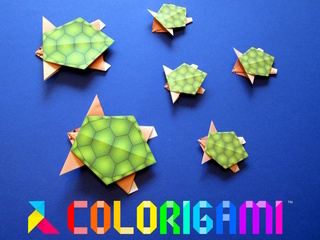 On Colorigami you can color origami models online that you can then print and fold. Origamis look much better when they are colored with patterns and gradients, but they are also much easier to fold because all the folds are already marked. No more head scratching to try to understand instructions and diagrams that require a degree in paper folding. With Colorigami, origami becomes a piece of cake! • Monday 31/03/2014 • Be the first to comment! Origami is much easier with models you can color. All folds are already marked and you can't make a mistake. And with our online coloring app with patterns, colors and gradients, creating wonderful unique origamis is a piece of cake! Origami is the art of folding paper to create evocative shapes: animals, flowers, boxes etc. With Colorigami, the paper is a colored drawing, so the models are even more evocative, and the folding is much easier: all the folds are already marked, so it is very easy to know where to fold. You can print all models with a printer on standard paper. We publish very easy origami models, instructions and tutorials that even young children can make and follow (with sometimes a bit of help), and also more advanced but still very easy to make models. DIY, decoration, games, papertoys etc. You can use the origami models to create objects (mobiles, boxes, vases, gifts etc. ), to decorate a room, to play etc. It is not necessary to buy special paper for origami (Japanese washi paper etc. ): you can also print your own patterned paper on standard letter or A4 sheets. For paper toys and cards, you can also use heavier / stronger paper. All the elements of this site (texts, drawings, pictures, patterns, code etc.) are protected. All rights reserved.